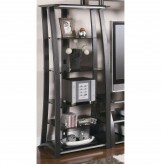 This sleek media tower has a simple design with plenty of storage space, adjustable shelves and drawers at the bottom. 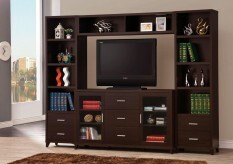 You can use it as a bookcase on its own or pair two of them with the matching tv console and bridge for your complete entertainment center needs. Finished in cappuccino to make decorating easy, accented with tapered legs and brushed silver hardware. 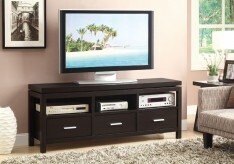 Furniture Nation is proud to offer the Monroe Media Tower online. We serve customers across the DFW region including Southlake, Grapevine, Frisco and many more. L21.25" x D11.5" x H76"